Hawai‘i Pacific University will soon be the largest private occupant of real estate in the heart of downtown Honolulu. Pursuant to its 2014 master plan to be a centralized urban campus, the University recently announced its plans to move into over 120,000 square feet of newly-leased space, creating a dynamic student experience. 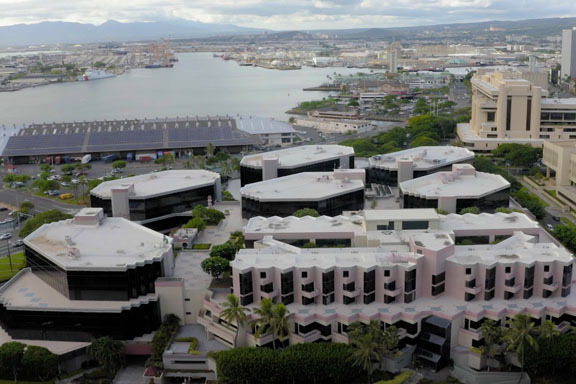 When completed, HPU will occupy over 350,000 square feet in downtown Honolulu. The consolidation will provide HPU with the opportunity to expand on its plan to create new state-of-the-art facilities including over 30 classrooms that will promote active, personalized education, enriched distance learning and a one-stop student center for centralized convenience. Dedicated science and nursing labs will offer hands-on learning and first-class research space, and the new library will provide research, study and meeting spaces for both students and faculty. Perkins+Will has been engaged for space planning, design and construction administration for the build out of the College of Natural and Computational Sciences at Waterfront Plaza and to develop plans for the College of Health and Society and the one-stop student service center at Waterfront Plaza. G70 has been engaged for space planning and design of the College of Professional Studies and executive offices at Pioneer Plaza. They will also provide space planning for the consolidated library, classrooms and the College of Liberal Arts at Waterfront Plaza. HPU is moving forward to provide a world-class urban campus, where our students will live, learn and pursue their life passions and engage more with our community. Central to our vision is delivering on the promise to provide a hub of student life at Aloha Tower Marketplace with centers for student learning in close proximity at Pioneer and Waterfront Plazas. Take a moment to watch this presentation on HPU’s progress. We would love to hear from you regarding our Centralized Urban Campus plan. Please feel free to leave us a comment.